Ministry of Paintball fail to deliver paintball party. Paintball is an ever-popular activity for birthday parties. That’s why each week throughout the UK Delta Force hosts countless birthday parties for people of all ages – from 10 year old Ben enjoying a day out with friends at our Upminster centre in Essex, to Michelle welcoming her 40th birthday with game at Effingham, Surrey. 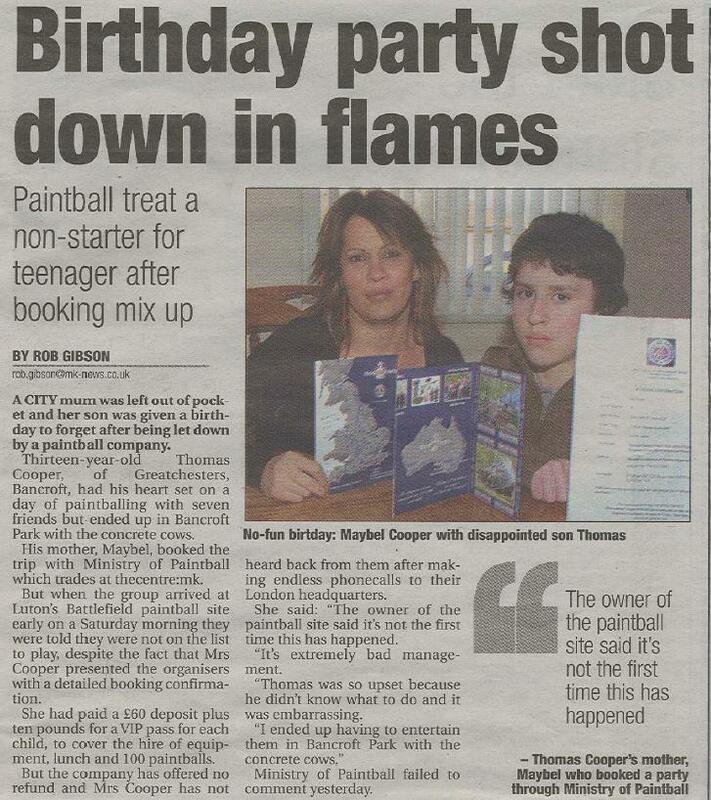 That’s why we were so shocked to hear of Thomas Cooper’s 13th birthday go so wrong at Ministry of Paintball. His mother, Maybel, purchased paintball tickets from a Ministry of Paintball ticket seller, and organised a day to celebrate Tom’s birthday with seven of his friends. Upon arriving at the paintball centre, Maybel and the boys found out that there were no records of their booking, and they would not be able to play on the day. To add further insult to injury, Maybel is yet to receive a refund or apology from Ministry of paintball. At Delta Force we accept all paintball tickets or vouchers sold from registered companies, however after almost 20 years of experience in the UK paintball industry we recommend purchasing any paintball tickets from the reputable IPG-approved ticket resellers. IPG are 5-star accredited members of the UK Paintball Association, and have almost 6 years of experience providing a premium service to paintball enthusiasts throughout the UK. The attached news article is sadly an all too common occurrence for customers with Ministry of Paintball tickets. If you have joined the growing list of dissatisfied Ministry of Paintball customers then please email info@paintballgames.co.uk to swap your tickets with IPG vouchers, and for a limited time IPG will give you one free booklet of tickets to further help you organise a paintball event. If you want to contact an IPG-approved paintball ticket reseller to purchase some paintball tickets then please email info@paintballgames.co.uk and we will be able to put you in contact with one of your closest resellers.